MagnaClean Professional2 Filter is a proven, high efficiency, full-flow magnetic filter designed to tackle all central heating systems removing virtually 100% of the suspended black iron oxide. This professional filter sets an industry standard for plumbing and heating engineers when it comes to protecting and maintaining both new and existing heating systems. The MC1+ is a new advanced central heating system protector from Adey Solutions. It prevents scale and corrosion within your central heating system and is suitable to be used with all open vented and sealed systems. 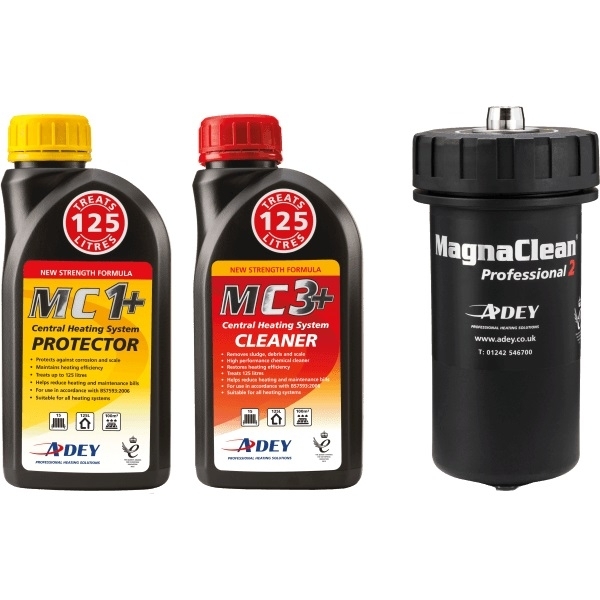 The MC1+ has exceptional results when used with the Adey Magna Clean and offers long term protection. The MC3+ is a new advanced central heating system cleaning formula from Adey Solutions. It is designed to remove and debris or sludge from the system that shouldn't be there. The MC3+ can be used in all heating systems whether your system is sealed or open vented. Using it with the Adey MagnaCleanse brings out exceptional results. It is also possible to perform a full system cleanse in just two hours.